COMING AT THE RIGHT TIME! COMING AT THE RIGHT TIME is always preferable my dear ladies and occasional gentleman and that’s just what Veronica and I did. 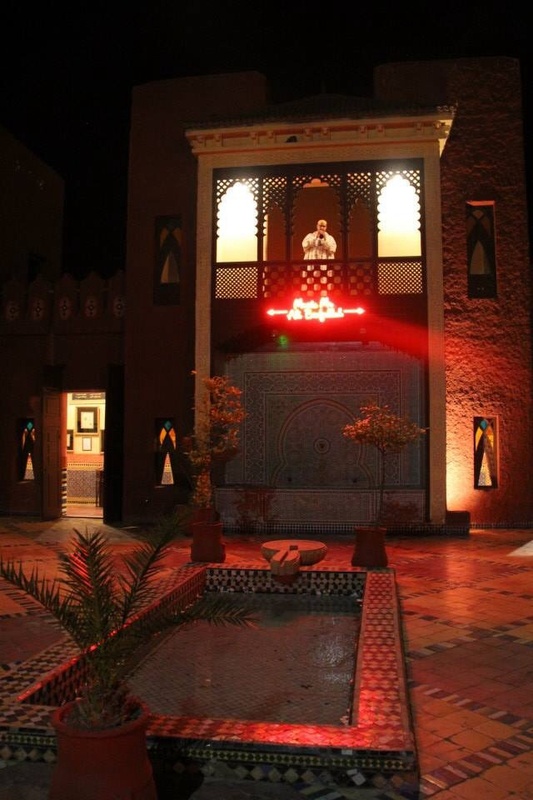 As the RIAD door opened a great cheer rose up from the courtyard into the MARRAKECH night sky. Though that could be because everyone had been waiting 2 hours for their dinner. The GORGEOUS and CHARMING Nicholas welcomed us and one of his lovely assistants took us to our room for a quick change but I’m not going into to detail as to what Veronica did with a WET-WIPE! How wonderful to meet up with our fellow ‘FANNY’ her family and friends on her birthday. 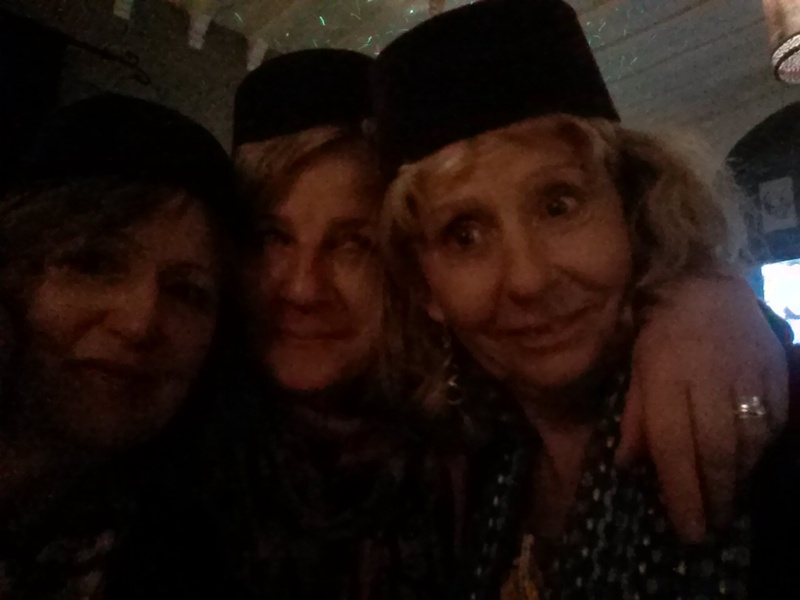 Due to our ‘SPECIAL BOTTLED WATER’ imbibed on the plane, we were already in the PARTY SPIRIT and threw ourselves into the BELLY-DANCING, I say with modesty I know I impressed the professional dancer but Veronica danced her usual 2 beats behind the music in her WILD WANTON manner. Dear Lauren introduced us to a variety of ALCOHOLIC SHOTS. What fun! 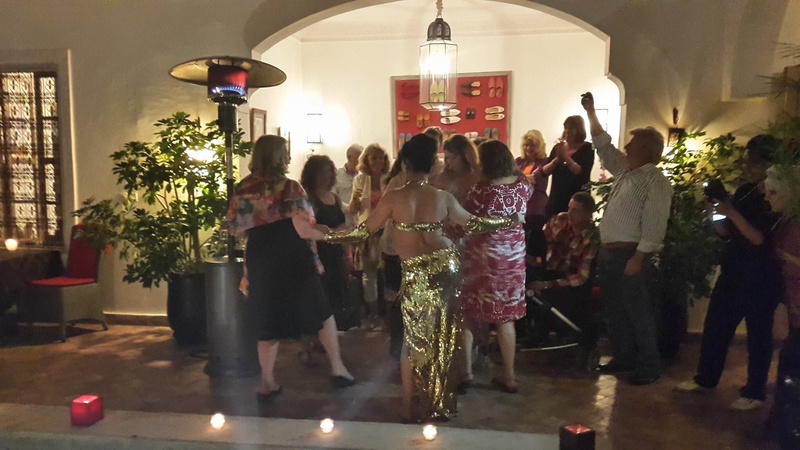 The evening ended with the 3 ‘FANNY’S singing KARAOKE with the boys from the band. BRITTANY SPEARS was a highlight but it all went a bit downhill after YMCA. p.s. With apologies Nicholas for borrowing your Fez’s from your window display. WHIFF OF SUSPICIOUS APPLES & BLADDERS! My dear ladies and occasional gentleman, at the AIRPORT near the front of the queue we were soon standing in front of SECURITY. He was not in a hurry, taking ages checking me, my passport at his screen but that was nothing compared to how long he took with Veronica! She gets so flustered when encountering a man in UNIFORM, she has the WHIFF OF SUSPICION about her. We were the last 2 passengers. There was relief on our taxi driver’s face then a beaming smile as he realised he hadn’t lost us. In the posh TAXI we shot out into the traffic with the driver pointing out with pride the 1000 year old MOSQUE in the dark. Once in the MEDINA wiggling our way through people, animals and bikes, we came to a stop when the car could squeeze through no further.We alighted and the driver took our cases and strode off into the hustle and bustle with us trying to keep up with him. Through alleys, twisting and turning not having a clue where we were or where we were going. “There’s a lot of trust going on here but a man who provides polished APPLES in NAPKINS in the back of his taxi must be OK mustn’t he?” I said to Veronica over the head of a DONKEY as we trotted along trying to keep up with our luggage. “Remember SNOW WHITE and the POISONED APPLE!” Says Veronica. Which gave us slightly HYSTERICAL giggles, which had an unfortunate effect on Veronica’s BLADDER. Let’s hope we have time to change before the party! SMILE WARMS THE HEART OF THE LADYGARDEN. My dear ladies and occasional gentleman, WE HAVE LANDED. Isn’t it the most enjoyable sensation when you step out of the plane at the airport onto that top step to the warmth, exotic smells and sounds? And isn’t it an enjoyable sensation when your eyes lock on to an extraordinarily HANDSOME young airport official at the bottom of the steps. And isn’t it an enjoyable sensation when he runs up the steps, gives me a gorgeous smile and carries my case down for me. And isn’t it an enjoyable sensation to look back at my dear friend Veronica’s face as she lugs her case down the steps behind me. My dear ladies and occasional gentleman, you will be pleased to know that my dear friend Veronica and I made it onto the MARRAKECH EXPRESS or EASYJET FLIGHT 6021, with our ‘WATER BOTTLES’ intact. We were lucky enough to be seated next to a delightful lady J who gave us useful advice for our stay; she and her partner are restoring a RIAD and we hope to keep in touch. Veronica was on the AISLE seat in order to stretch her legs but unfortunately there was a group of people who thought it was a good idea to stand and chat in the aisle for virtually the WHOLE FLIGHT! One of whom stuck her BOTTOM next to Veronica’s head! Which I wouldn’t do especially after she’s downed HALF A BOTTLE OF VODKA! Veronica was on the point of ATTACK when the CROQUE MONSIEUR, TWIX and TEA was served. In the AIRPORT Lady J was a hero when she ran back out onto the TARMAC and FLAGGED down our AIRPLANE to retrieve my GLASSES which I had left in the seat pocket, what a woman. 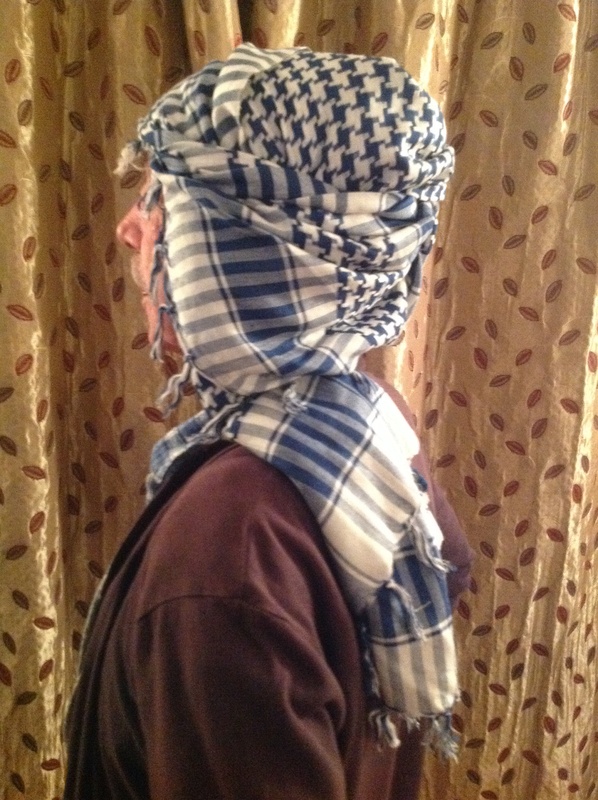 RONALD OF ARABIA, yes my dear ladies and occasional gentleman, Ronald loves his new scarf , a present from Morocco.